Many marine animals are often found in areas with high levels of commercial vessel traffic. Given this spatial overlap, increasing shipping activities worldwide, and the potential overlap between audible frequency ranges and ship noise for many marine species, long term exposure to underwater noise associated with commercial vessel traffic is a topic of increasing public and scientific interest and is an important management concern. Commercial ships for this discussion include cargo ships, container ships, tankers, barges, passenger ships, and ferries. These produce underwater noise primarily at low frequencies (below 500 Hz). Underwater sound created by smaller vessels, recreational boats, and other vessels that do not repeatedly follow “regular routes” (whale watching boats and fishing vessels), also contribute to local marine soundscapes, especially in coastal habitats. However, those sound sources are not considered in this discussion. Prior to the mid-19th century Industrial Revolution, low-frequency sound in the ocean was due to natural sources such as spray and bubbles associated with breaking waves, sounds generated by marine life, and seismic noise. The Industrial Revolution marked the beginning of the use of motor-powered vessels. Increases in commercial vessel traffic since that time are believed to have caused low-frequency noise levels to increase in many oceanic locations (for more information see How does shipping affect ocean sound levels?). The amount of low-frequency noise associated with ships varies geographically and is greater in regions with heavy commercial shipping traffic. There tend to be fewer ships in the southern hemisphere, and low-frequency ambient noise levels are substantially lower than in the northern hemisphere as a resultCato, D. H. (1976). Ambient sea noise in waters near Australia. The Journal of the Acoustical Society of America, 60(2), 320–328. https://doi.org/10.1121/1.381109.McCauley, R. D., Cato, D. H., & Duncan, A. J. (2016). Regional Variations and Trends in Ambient Noise: Examples from Australian Waters. In A. N. Popper & A. Hawkins (Eds. ), The Effects of Noise on Aquatic Life II (Vol. 875, pp. 687–696). New York, NY: Springer New York. https://doi.org/10.1007/978-1-4939-2981-8_83.. 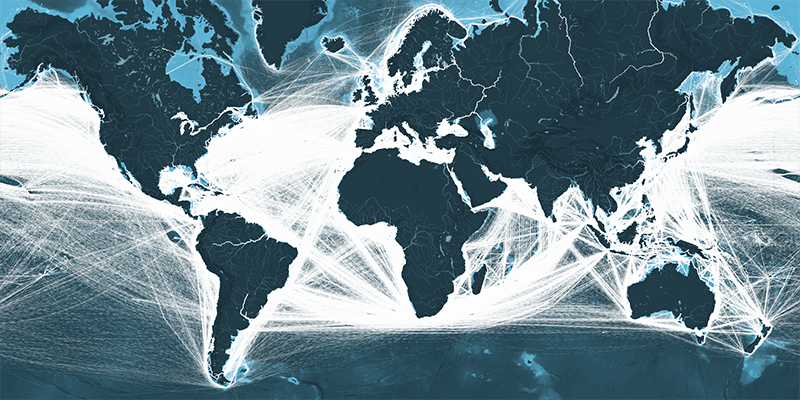 Global ship tracks from 2012 superimposed on a bathymetric map. Color intensity represents ship density. Colors represent type of ship traffic: Container – yellow, dry bulk – blue, tanker – red, gas bulk – green, vehicles – purple. Map created by Kiln Digital, www.kiln.digital, used with permission. See the same map in a single color. Ships’ propulsion systems and other machinery generate underwater noise. Cavitation that occurs at the propeller blade tips is a particularly significant source of noise. 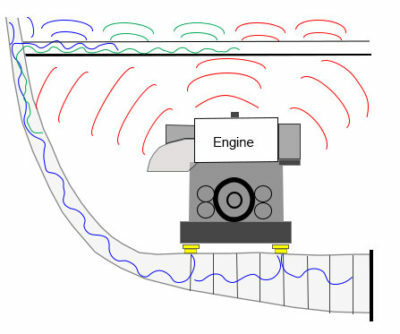 In addition, flow past the ship’s hull generates broadband sound, particularly at higher ship speeds. The amount of underwater noise produced depends on numerous factors, including ship type, size, hull shape, propulsion system, ship speed, ship load, and sea conditions. For example, a modern commercial ship in the Santa Barbara Channel off California, was found to produce broadband source levels (20–1000 Hz) as high as 188 dB re 1µPa @ 1 m (rms). This ship was a 54,000 gross ton container ship traveling at 21.7 knots (11.2 m/s) McKenna, M. F., Ross, D., Wiggins, S. M., & Hildebrand, J. A. (2012). Underwater radiated noise from modern commercial ships. The Journal of the Acoustical Society of America, 131(1), 92–103. https://doi.org/10.1121/1.3664100.. However, the measured levels can be affected by water depth, oceanographic conditions, bottom composition, and orientation, as well as distance of the receiver with respect to the ship. One major concern related to commercial vessel noise is the potential for masking of biologically significant signals. Masking occurs when noise interferes with an animal’s ability to perceive (detect, interpret, and/or discriminate) a sound. The degree of masking is influenced by the level, frequency band, and the duration of the noise in comparison to the animal’s normal ability to detect the sound of interest. Masking could lead to possible negative effects including diminished abilities to find a mate, maintain social structure and cohesion, find food, navigate, and/or avoid predation. Other potential effects of underwater sound associated with commercial vessel traffic include causing animals to change their behaviors (e.g., move away due to fear of the sound) or respond differently to other sounds of importance to them. Sounds associated with commercial vessel traffic are highly variable, propagation patterns can be complex, and it can be challenging to discern if the physical presence of a passing ship, the sound associated with the ship, or both, caused an observed response. Furthermore, it is important to note that responses to the same stimulus will differ across species, among individuals, and within the same individual under different circumstances. Consequently, further research and modeling efforts are needed to fully understand responses that have been measured and determine any long term, large scale consequences of commercial vessel traffic sounds. Studies investigating masking in fishes due to commercial shipping are limited. In the presence of ferryboat noise, hearing of the Lusitanian toadfish was masked at multiple frequenciesVasconcelos, R. O., Amorim, M. C. P., & Ladich, F. (2007). Effects of ship noise on the detectability of communication signals in the Lusitanian toadfish. Journal of Experimental Biology, 210(12), 2104–2112. https://doi.org/10.1242/jeb.004317.. Ship noise appeared to interfere with the fish being able to acoustically detect other members of its species. This has potential reproductive impacts as, in the presence of shipping, females may be unable to detect the characteristic boatwhistle calls nesting males produce during the mating season. Atlantic cod and haddock also produce vocalizations during the mating season that occupy the same frequency range as many anthropogenic sound sources, including commercial shipping. Peak acoustic energy for the vocalizations is 50-260 Hz. Data from Stellwagen Bank National Marine Sanctuary (SBNMS), off the U.S. east coast, suggest that sounds produced by spawning Atlantic cod and haddock as a cue for courtship may be masked by shipping. If shipping noise reduces the efficiency of these vocalizations, this could cause a reduction in the ability of males to attract mates, incorrect mate assessment for females, and overall mistiming for spawningStanley, J. A., Van Parijs, S. M., & Hatch, L. T. (2017). Underwater sound from vessel traffic reduces the effective communication range in Atlantic cod and haddock. Scientific Reports, 7(1), 14633. https://doi.org/10.1038/s41598-017-14743-9..
Spectrogram showing a 1-hour vessel passage and haddock vocalizations at a haddock winter spawning site in SBNMS. One can see the pulsed grunts of the haddock at the start and end of the spectrogram, and the vessel passage in the center. Reprinted with permission from Stanley, J. A., Van Parijs, S. M., & Hatch, L. T. (2017). Underwater sound from vessel traffic reduces the effective communication range in Atlantic cod and haddock. Scientific Reports, 7(1), 14633. Low frequency rumble produced by hundreds of sound producing male haddock during the spawning season in Balsfjord, a subarctic fjord close to Tromsø, Norway. Sound credit: Anthony Hawkins, Loughine Ltd.
Ship noise has been found to also affect schooling and foraging behaviors in fishes. Sounds produced by ferryboats and hydrofoils were shown to affect blue-fin tuna in large oceanic pensSarà, G., Dean, J., DAmato, D., Buscaino, G., Oliveri, A., Genovese, S., … Mazzola, S. (2007). Effect of boat noise on the behaviour of bluefin tuna Thunnus thynnus in the Mediterranean Sea. Marine Ecology Progress Series, 331, 243–253. https://doi.org/10.3354/meps331243.. Noise from boats significantly influenced the swimming behavior of the tuna, their position in the water column, and their schooling structure. Controlled, laboratory playback studies with estuarine fishes showed a reduction in foraging events in the presence of cargo ship recordingsVoellmy, I. K., Purser, J., Flynn, D., Kennedy, P., Simpson, S. D., & Radford, A. N. (2014). Acoustic noise reduces foraging success in two sympatric fish species via different mechanisms. Animal Behaviour, 89, 191–198. https://doi.org/10.1016/j.anbehav.2013.12.029.. The fishes startled more often in the presence of shipping noise (stress- or fear- related response) and either decreased foraging effort during playback or made more foraging errors. Reduced food consumption may have energetic impacts (reduction of time and energy available to support other critical activities). Many cetacean species have been found to modify their vocalizations in the presence of commercial vessel traffic. Image credit: John Calambokidis, Cascadia Research. Masking of biologically significant signals due to ship noise is a key concern for marine mammals, especially baleen whales, which produce signals in frequency bands that overlap with the dominant sounds from commercial vessels. Researchers have found many cetacean species (e.g. humpback whales, fin whales, North Atlantic right whales, killer whales, and beluga whales) modify their vocalizations in the presence of commercial vessel traffic. Common vocalization changes included increasing intensity (Lombard Effect), shifting frequencies, changing calling rate, or ceasing calling altogether. It is important to consider the potential impacts of modifying calling behavior to compensate for interference from other sound sources, such as commercial vessel traffic. There may be physiological or behavioral responses, impaired communication, or a reduced use of important habitat or resources due to poor acoustic quality. These impacts can affect the fitness of an animal and have population-level consequences. “Communication space” refers to the area over which an individual can detect conspecific signals. Studies have been conducted in Stellwagen Bank National Marine Sanctuary (SBNMS) to characterize how long term noise from commercial vessels reduces the communication space for various species. 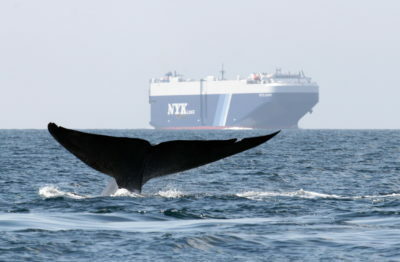 Using recordings from merchant vessels on SBNMS in 2007, a modeling approach showed that vessel noise has the potential to reduce the area over which fin whale, humpback whale, and North Atlantic right whale vocalizations can be detectedClark, C., Ellison, W., Southall, B., Hatch, L., Van Parijs, S., Frankel, A., & Ponirakis, D. (2009). Acoustic masking in marine ecosystems: intuitions, analysis, and implication. Marine Ecology Progress Series, 395, 201–222. https://doi.org/10.3354/meps08402.. Using a similar analysis another study estimated that current ambient noise and commercial vessel noise, contributed most heavily to the loss of communication space for fin, humpback, and minke whales in the SBNMSCholewiak, D., Clark, C., Ponirakis, D., Frankel, A., Hatch, L., Risch, D., … Van Parijs, S. (2018). Communicating amidst the noise: modeling the aggregate influence of ambient and vessel noise on baleen whale communication space in a national marine sanctuary. Endangered Species Research, 36, 59–75. https://doi.org/10.3354/esr00875.. Since the SBNMS and surrounding waters are key foraging habitats used by several endangered whale species, the substantial loss of communication space in such a biologically important area may have significant consequences. In addition to masking, the presence of commercial vessel traffic sounds can impact marine mammal behaviors such as foraging. Tagged humpback whales have been found to alter their feeding behavior in the presence of ship noise. As the ship noise increased, the whales exhibited slower descent rates and decreased side-roll feeding events per diveBlair, H. B., Merchant, N. D., Friedlaender, A. S., Wiley, D. N., & Parks, S. E. (2016). Evidence for ship noise impacts on humpback whale foraging behaviour. 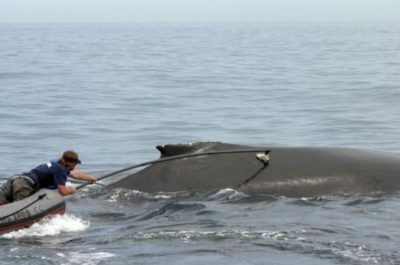 Biology Letters, 12(8), 20160005. https://doi.org/10.1098/rsbl.2016.0005..
A whale researcher from the Stellwagen Bank National Marine Sanctuary (SBNMS) carefully tags a humpback whale with a suction-cup mounted acoustic recording tag to study its movements and acoustic behavior. Image credit: NOAA. Although most sounds associated with commercial vessel traffic are typically below 500 Hz, data show ship sounds can extend to frequencies well above 1 kHz, albeit with lower source levels than the low frequency components. These higher frequencies may overlap with the vocalizations, hearing ranges, and echolocation abilities of odontocetes. More research is needed to fully quantify the high frequency components of commercial ship sounds and their potential effect on marine animals. Multiple activities have focused on reducing ship-related underwater noise. These activities include the publication of international acoustic standards, the European Union Marine Strategy Framework Directive, and the International Maritime Organization (IMO) non-mandatory guidelines. Ship quieting measures recommended by the IMO include the installation or modification of propellers to reduce cavitation; regular propeller cleaning to remove marine fouling and reduce surface roughness; designing hulls to produce a uniform wake; maintaining a smooth underwater hull surface to reduce resistance; selecting ship machinery with inherently low noise and vibration levels; and installing “soft” or “elastic” vibration isolators and/or isolation mounts located between the ship’s machinery and the hull. Reducing ship speed can also reduce ship noise. However, modeling of vessel traffic and beluga whale movements in the St. Lawrence Estuary have shown that slower ships may cause received levels of ship noise to be present in an area of concern for a longer period of timeChion, C., Lagrois, D., Dupras, J., Turgeon, S., McQuinn, I. H., Michaud, R., … Parrott, L. (2017). Underwater acoustic impacts of shipping management measures: Results from a social-ecological model of boat and whale movements in the St. Lawrence River Estuary (Canada). Ecological Modelling, 354, 72–87. https://doi.org/10.1016/j.ecolmodel.2017.03.014. Efforts to moderate the effects of ship noise also include the use of underwater acoustic propagation models to assess the “noise footprint” of individual vessels and to produce “noise maps” that show the contributions of multiple vessels to the local ambient noise. This is especially important for vulnerable habitats and sensitive speciesErbe, C., Williams, R., Sandilands, D., & Ashe, E. (2014). Identifying modeled ship noise hotspots for marine mammals of Canada’s Pacific region. PLoS ONE, 9(3), e89820. https://doi.org/10.1371/journal.pone.0089820.Frankel, A., & Gabriele, C. (2017). Predicting the acoustic exposure of humpback whales from cruise and tour vessel noise in Glacier Bay, Alaska, under different management strategies. Endangered Species Research, 34, 397–415. https://doi.org/10.3354/esr00857..
Science > How does shipping affect ocean sound levels? Dahl, P. H., Miller, J. H., Cato, D. H. & Andrew, R. K. (2007). Underwater ambient noise. Acoustics Today, 3, 23-33.
International Maritime Organization. (2014). Guidelines for the reduction of underwater noise from commercial shipping to address impacts on marine life. Dyndo, M., Wiśniewska, D. M., Rojano-Doñate, L., & Madsen, P. T. (2015). Harbour porpoises react to low levels of high frequency vessel noise. Scientific Reports, 5, 11083. Fletcher, H., & Munson, W. A. (1937). Relation between loudness and masking. The Journal of the Acoustical Society of America, 9(1), 78–78. https://doi.org/10.1121/1.1902030. Gard, R. (1974). Aerial census of gray whales in Baja California lagoons, 1970 and 1973, with notes on behavior, mortality and conservation. California Fish and Game, 60(3), 132–143. Hatch, L., Clark, C., Merrick, R., Van Parijs, S., Ponirakis, D., Schwehr, K., … Wiley, D. (2008). Characterizing the Relative Contributions of Large Vessels to Total Ocean Noise Fields: A Case Study Using the Gerry E. Studds Stellwagen Bank National Marine Sanctuary. Environmental Management, 42(5), 735–752. https://doi.org/10.1007/s00267-008-9169-4. Hatch, L. T., Clark, C. W., Van Parijs, S. M., Frankel, A. S., & Ponirakis, D. W. (2012). Quantifying loss of acoustic communication space for right whales in and around a U.S. national marine sanctuary. Conservation Biology, 26(6), 983–994. https://doi.org/10.1111/j.1523-1739.2012.01908.x. Holt, M. M., Noren, D. P., Veirs, V., Emmons, C. K., & Veirs, S. (2009). Speaking up: Killer whales ( Orcinus orca ) increase their call amplitude in response to vessel noise. The Journal of the Acoustical Society of America, 125(1), EL27–EL32. https://doi.org/10.1121/1.3040028. Jones, E. L., Hastie, G. D., Smout, S., Onoufriou, J., Merchant, N. D., Brookes, K. L., & Thompson, D. (2017). Seals and shipping: quantifying population risk and individual exposure to vessel noise. Journal of Applied Ecology, 54(6), 1930–1940. https://doi.org/10.1111/1365-2664.12911. Lesage, V., Barrette, C., Kingsley, M. C. S., & Sjare, B. (1999). The effect of vessel noise on the vocal behavior of belugas in the St. Lawrence River Estuary, Canada. Marine Mammal Science, 15(1), 65–84. https://doi.org/10.1111/j.1748-7692.1999.tb00782.x. McDonald, M. A., Hildebrand, J. A., & Wiggins, S. M. (2006). Increases in deep ocean ambient noise in the Northeast Pacific west of San Nicolas Island, California. The Journal of the Acoustical Society of America, 120(2), 711–718. https://doi.org/10.1121/1.2216565. Parks, S. E., Clark, C. W., & Tyack, P. L. (2007). Short- and long-term changes in right whale calling behavior: The potential effects of noise on acoustic communication. The Journal of the Acoustical Society of America, 122(6), 3725–3731. https://doi.org/10.1121/1.2799904. Pine, M. K., Jeffs, A. G., Wang, D., & Radford, C. A. (2016). The potential for vessel noise to mask biologically important sounds within ecologically significant embayments. Ocean & Coastal Management, 127, 63–73. https://doi.org/10.1016/j.ocecoaman.2016.04.007. Pirotta, E., Milor, R., Quick, N., Moretti, D., Di Marzio, N., Tyack, P., … Hastie, G. (2012). Vessel Noise Affects Beaked Whale Behavior: Results of a Dedicated Acoustic Response Study. PLoS ONE, 7(8), e42535. https://doi.org/10.1371/journal.pone.0042535. Redfern, J., Hatch, L., Caldow, C., DeAngelis, M., Gedamke, J., Hastings, S., … Porter, M. (2017). Assessing the risk of chronic shipping noise to baleen whales off Southern California, USA. Endangered Species Research, 32, 153–167. https://doi.org/10.3354/esr00797. Scheifele, P. M., Andrew, S., Cooper, R. A., Darre, M., Musiek, F. E., & Max, L. (2005). Indication of a Lombard vocal response in the St. Lawrence River beluga. The Journal of the Acoustical Society of America, 117(3), 1486–1492. https://doi.org/10.1121/1.1835508. Simpson, S. D., Purser, J., & Radford, A. N. (2015). Anthropogenic noise compromises antipredator behaviour in European eels. Global Change Biology, 21(2), 586–593. https://doi.org/10.1111/gcb.12685. 1. ↑ Cato, D. H. (1976). Ambient sea noise in waters near Australia. The Journal of the Acoustical Society of America, 60(2), 320–328. https://doi.org/10.1121/1.381109. 2. ↑ McCauley, R. D., Cato, D. H., & Duncan, A. J. (2016). Regional Variations and Trends in Ambient Noise: Examples from Australian Waters. In A. N. Popper & A. Hawkins (Eds. ), The Effects of Noise on Aquatic Life II (Vol. 875, pp. 687–696). New York, NY: Springer New York. https://doi.org/10.1007/978-1-4939-2981-8_83. 3. ↑ McKenna, M. F., Ross, D., Wiggins, S. M., & Hildebrand, J. A. (2012). Underwater radiated noise from modern commercial ships. The Journal of the Acoustical Society of America, 131(1), 92–103. https://doi.org/10.1121/1.3664100. 4. ↑ Vasconcelos, R. O., Amorim, M. C. P., & Ladich, F. (2007). Effects of ship noise on the detectability of communication signals in the Lusitanian toadfish. Journal of Experimental Biology, 210(12), 2104–2112. https://doi.org/10.1242/jeb.004317. 5. ↑ Stanley, J. A., Van Parijs, S. M., & Hatch, L. T. (2017). Underwater sound from vessel traffic reduces the effective communication range in Atlantic cod and haddock. Scientific Reports, 7(1), 14633. https://doi.org/10.1038/s41598-017-14743-9. 6. ↑ Sarà, G., Dean, J., DAmato, D., Buscaino, G., Oliveri, A., Genovese, S., … Mazzola, S. (2007). Effect of boat noise on the behaviour of bluefin tuna Thunnus thynnus in the Mediterranean Sea. Marine Ecology Progress Series, 331, 243–253. https://doi.org/10.3354/meps331243. 7. ↑ Voellmy, I. K., Purser, J., Flynn, D., Kennedy, P., Simpson, S. D., & Radford, A. N. (2014). Acoustic noise reduces foraging success in two sympatric fish species via different mechanisms. Animal Behaviour, 89, 191–198. https://doi.org/10.1016/j.anbehav.2013.12.029. 8. ↑ Clark, C., Ellison, W., Southall, B., Hatch, L., Van Parijs, S., Frankel, A., & Ponirakis, D. (2009). Acoustic masking in marine ecosystems: intuitions, analysis, and implication. Marine Ecology Progress Series, 395, 201–222. https://doi.org/10.3354/meps08402. 9. ↑ Cholewiak, D., Clark, C., Ponirakis, D., Frankel, A., Hatch, L., Risch, D., … Van Parijs, S. (2018). Communicating amidst the noise: modeling the aggregate influence of ambient and vessel noise on baleen whale communication space in a national marine sanctuary. Endangered Species Research, 36, 59–75. https://doi.org/10.3354/esr00875. 10. ↑ Blair, H. B., Merchant, N. D., Friedlaender, A. S., Wiley, D. N., & Parks, S. E. (2016). Evidence for ship noise impacts on humpback whale foraging behaviour. Biology Letters, 12(8), 20160005. https://doi.org/10.1098/rsbl.2016.0005. 11. ↑ Chion, C., Lagrois, D., Dupras, J., Turgeon, S., McQuinn, I. H., Michaud, R., … Parrott, L. (2017). Underwater acoustic impacts of shipping management measures: Results from a social-ecological model of boat and whale movements in the St. Lawrence River Estuary (Canada). Ecological Modelling, 354, 72–87. https://doi.org/10.1016/j.ecolmodel.2017.03.014. 12. ↑ Erbe, C., Williams, R., Sandilands, D., & Ashe, E. (2014). Identifying modeled ship noise hotspots for marine mammals of Canada’s Pacific region. PLoS ONE, 9(3), e89820. https://doi.org/10.1371/journal.pone.0089820. 13. ↑ Frankel, A., & Gabriele, C. (2017). Predicting the acoustic exposure of humpback whales from cruise and tour vessel noise in Glacier Bay, Alaska, under different management strategies. Endangered Species Research, 34, 397–415. https://doi.org/10.3354/esr00857.